This past weekend I was hanging out on the boardwalk and noticed tons of fair food. From funnel cakes and elephant ears to pronto pups (corn dogs) and deep fried Oreos the boardwalk had a wide variety of fried foods. I passed up on the opportunity to indulge, but later found myself making my own batch of corn dogs to have at the beach with friends. They were everything I had hoped for and I think they’ll become a beach staple this summer. 1. Mix all dry ingredients, and then add eggs and milk. 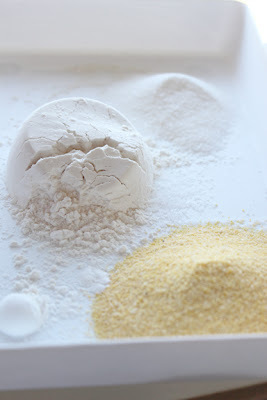 Mix until lump free. 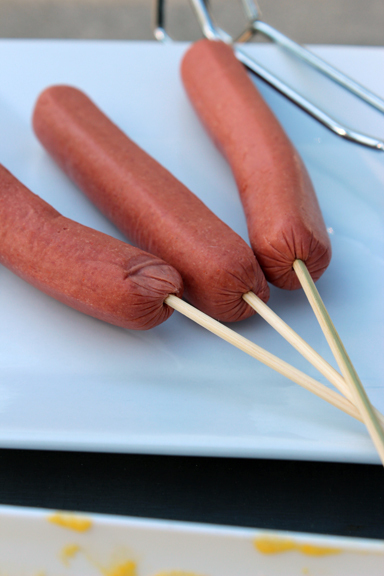 Insert a skewer into each hot dog. 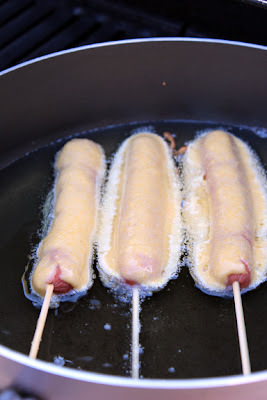 Dip hot dogs into the batter to coat. 2. Deep fry in hot oil (I did this on the bbq). When light golden brown remove and place on a paper towel. Makes one package hot dogs with heavy crust or two packages with light. Corn dogs always remind me of summer bbq's and 4th of July! My littler brother would love these! I seriously love corn dogs. I bet they are so good when you make them yourself! umm totally hungry right now!! If I can figure out how to deep dry without the bbq then I am definitely making these!